(Rancho Cordova, CA) -- Ready for a really good scare? Not only will you find some excellent haunts at the Heartstoppers Haunted House in Rancho Cordova, it is the ideal venue for such an attraction given the rumors that the “Old Mine Shaft” property itself is haunted. Not only are there two different themed areas within the main building, there’s a spooky outdoor “Malice in Wonderland” haunt in the former mini golf course and a dark and creepy basement and caves to complete the experience with spooks in every corner. Not scared enough? Aa new bonus attraction called the “Combat Laser Overload” is available for a small additional fee with ticket purchase. Underland Tickets include all attractions, plus an Old West Saloon waiting area indoors ( inclement weather won’t be a problem) where themed refreshments and souvenirs will be available to help guests prepare for or wind down from their Heartstoppers experience. An independent “spooky” photo studio will be set up for guests to capture a portrait of their Heartstoppers experience for a small additional fee. Tickets are $25, for those who don’t have the guts to wait in line and enjoy the anticipation, Fancy Pants tickets for $40 are available. For those wanting a truly unique and even more thrilling experience, pay $80 for an annual pass. Tickets are available at https://heartstoppershaunt.com/admission/ Heartstoppers has been bringing Halloween spooks and fun to the Sacramento region since 2007, always with the intention of giving back to the community. In partnership with the Cordova Community Council Foundation, Heartstoppers engages dozens of local youth volunteers each year. Students are exposed to creative arts education in animatronics, sound, lighting, art, theatre training (utilizing even out-of-state professional trainers), art development, construction, painting, costume and make-up design, and the volunteers gain valuable experience while having fun. 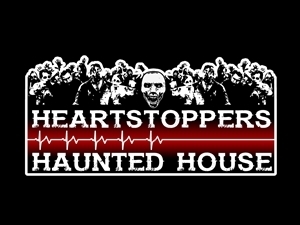 Hours Friday - Saturday 7:30 p.m. - 11:00 p.m.
Add Heartstoppers Haunted House to your free online travel itinerary.